by Angela Sehgal, Ed., A.T.C./L. and Kim Ortloff, L.M.T. Effective Do-It-Yourself Pain Relief Pain is the number one reason Americans visit their doctors. Back pain, muscle aches, and arthritis pain affect millions of people daily, limiting their activities and costing billions in medical care. Chances are you're one of them. Fortunately, much of this suffering is unnecessary. Where It Hurts and Why can help you take charge of your pain and become proactive in your recovery. The first step is to gain a better awareness of self and what is causing the pain. A handy pain worksheet will help you identify factors that contribute to pain, including physical, mental, and emotional stressors. A number of simple strategies have proven remarkably effective in relieving aches and pains. These include stretching, strengthening exercises, and self-massage techniques. Individual chapters provide you with detailed recommendations for specific areas of the body. You'll also find instructions for the immediate treatment of acute pain. Eliminating pain means creating a healthier lifestyle. A positive attitude can greatly alleviate pain and lead to a quicker recovery. Other actions that can be taken include eating a healthy diet, getting enough sleep, removing stressors from your environment, and finding humor and inspiration in your life. Where It Hurts and Why covers the following: A simple approach to identifying the causes of pain; Self-help techniques for pain relief; The importance of a positive attitude and healthy lifestyle; Stretches, exercises, and massage for specific areas of pain; When to seek professional help. 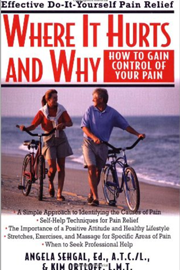 Where It Hurts and Why can help guide you to a life that is active, healthy, and free of pain.